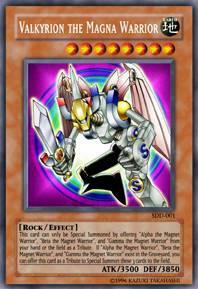 VALKYRION THE MAGNA WARRIOR - Yu-Gi-Oh! This card can only be Special summoned by offering «Alpha the magnet Warrior», «Beta the magnet Warrior» and « Gamma the magnet Warrior» from your hand on the field as a tribute. If offering «Alpha the magnet Warrior», «Beta the magnet Warrior» and « Gamma the magnet Warrior» exist in the graveyard, you can offer this card as tributes to Special summon these 3 cards to the field. elle est trop classe , mais dure a l'invoquer ! je l'ai !! !